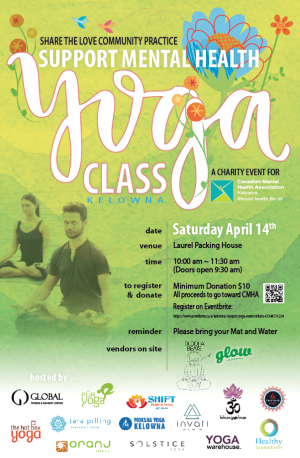 Kelowna Yoga House is participating in this collaboration of local yoga studios in support of The Canadian Mental Health Association (CMHA). Share the love at a community yoga class on Saturday, April 14th (10am - 11.30am) hosted by local Okanagan yoga studios. Teachers from each participating studio will be there assisting with the class. Bring your family and friends to practice and have fun in support of mental health in our community. All ages and levels are welcome! This class is by donation with 100% of proceeds going towards CMHA Kelowna. Bring a minimum $10 donation with you or donate in advance.